As per estimates of a report by Transparency Market Research (TMR), the global robotics market will attract a revenue worth US$147.26 bn by 2025 end rising at a healthy 17.4% CAGR over the forecast period from 2017 to 2025. The market was evaluated at US$35.23 bn in 2016. In terms of volume, the market is expected to reach an amount of 2,731.2 thousand units by 2025. The prime applications of robotic products include logistics, personal, military, last mile mobility, agriculture, construction/mining, entertainment, medical, research, and others. The other segment comprises automotive, aerospace, and food processing among others. The logistics segment has emerged as a significant application of robotic products and is anticipated to continue as the leading application segment in the next couple of years. The leading component segments of the global robotics market considered in this study are sensors, control units, actuators, brake systems, vision systems, and others. In 2016, sensors led the market followed by vision systems. With the increasing demand for enhanced sensing capabilities of robots, sensors are anticipated to display significant growth over the forecast period. The robotics market is classified on the basis of geography into North America, Asia Pacific, Europe, Latin America, and the Middle East and Africa. 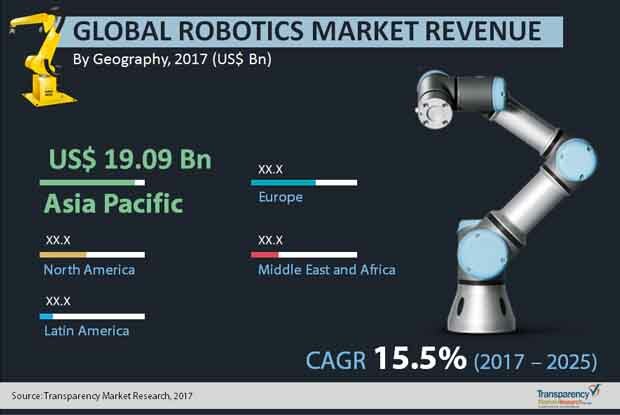 Asia Pacific held the leading share in the robotics market in 2016 and is anticipated to rise at a significant rate over the forecast period of 2017 to 2025. This is mainly because of incessant innovation and development in the field of robotics leading to its widespread application across industries. The Asia Pacific robotics market is also anticipated to gain from the advent of nano-technology in robotics in the future. Moreover, the introduction of collaborative robots that have substantially upped productivity in manufacturing, material handling, medical, and automotive sectors with less human labor will benefit the growth of this regional market over the forthcoming years. The report profiles leading players in the global robotics market, namely Fanuc Corporation, Clearpath Robotics Inc., Barrett Technology LLC, John Deere, Kuka AG, Honda Motor Co. Ltd., Boeing, Bossa Nova Robotics, Seegrid Corporation, Aetheon Inc., Google Inc., Swisslog, Northrop Grumman Corporation, iRobot Corporation, Lowe’s, Omron Adept Technologies, Amazon, Fetch Robotics Inc., and Savioke, Locus Robotics. The implementation of robotic technology in almost every industries across the globe has led them to grow at huge pace. In the recent years, it has been noticed that, robots are also being implemented in the medical science and healthcare solutions. Due to their enhanced accuracy and efficiency in handling various operations in medical sector, the healthcare solution companies as well as hospitals are adopting these robotic technologies heavily, in order to serve the patients in highly efficient manner. The demand for robotic surgery is significantly growing in the developed countries and is gaining the pace in the developing countries. Other application of robots in medical sectors includes rehabilitation, disinfection, pharmacy automation, telepresence and medical logistics among others. The emerging demand for workspace efficiency is resulting into the need for industrial robots globally. These robots are capable of moving inside the warehouse and factories without modifying layout. In addition these robots can autonomously re-plan their routes to avoid obstacles inside the factories. These factors are boosting the demand for such robots during the forecast period. The report on robotics market is segment on basis of various parameters such as types, application, components, and geography. The different types of robotics deployed in various industries includes mobile robotics, exoskeleton, and static robotics. Globally, the static robotics dominated the robotics market in 2016 and is estimated to retain its dominance in terms of revenue and volume during the forecast period. The demand for mobile robotics is significantly increasing across the globe and due to this, the segment is anticipated to be the fastest expanding segment over the period from 2017 to 2025, both in terms of revenue and volume consumed. The market for robotics is segmented on basis of application as logistics, personal, last mile mobility, military, agriculture, construction/mining, medical, entertainment, research and others. The others segment includes automotive, aerospace, food processing among others. Among the application, the military segment dominated the market for robotics in 2016, due to wide variety of application in defense forces across the globe. The logistics segment is estimated to be the fastest growing segment during the forecast period from 2017 to 2025. The growth of robotics in logistics is attributed to the fact that, the global logistics sector growing rapidly and the need to deliver the products in a faster and efficient way, the sector is adopting robotics technology heavily. The components segment in the global robotics market includes sensors, control units, actuators, brake systems, vision systems and others. Based on geography, the market for robotics is categorized as North America, Europe, Asia Pacific, Middle East and Africa and Latin America. The significant contribution of China in terms of revenue and volume in the robotics market, led Asia Pacific to have the upper hand in 2016. North America is anticipated to expand at a faster rate during the forecast period from 2017 to 2025. On basis of strategic regions across the globe, the major manufacturers of robots are considered in this research. The major manufacturers includes iRobot Corporation, Barrette Technology LLC, Swisslog, John Deere, Fanuc Corporation, Honda Motor Co. Ltd., Boeing, Seegrid Corporation, Google Inc., Lowe’s, Fanuc Corporation, Northrop Grumman Corporation, Amazon, , Clearpath Robotics Inc., Kuka AG, Bossa Nova Robotics, Savioke, Fetch Robotics, Aetheon Inc., Locus Robotics and Omron Adept Technologies among others.